Share a Little Cacao Love This Heart Month! Chocolate is exchanged as a symbol of love on Valentine’s Day, and for good reason — this superfood not only encourages feelings of happiness and bliss, it also helps boost your health in the process. 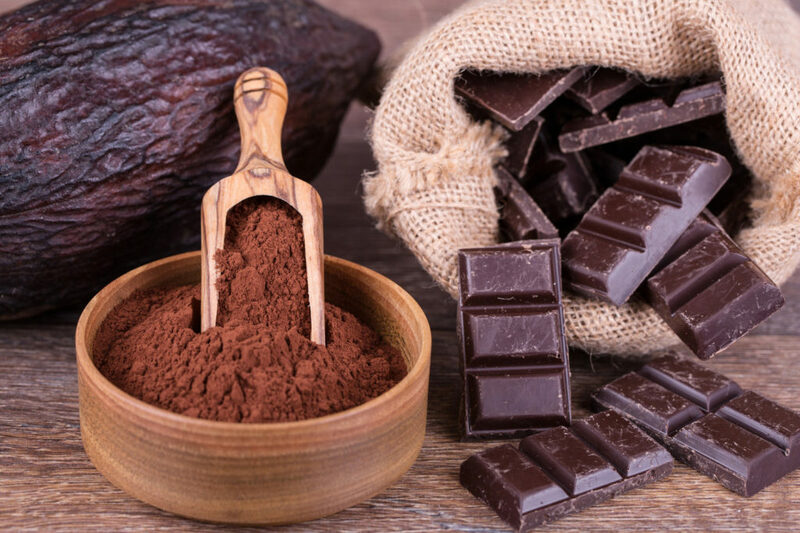 Read on for the lowdown on cacao, its health benefits and all the details you need to know when hunting for truly healthy chocolate. Both cocoa and cacao come from the cacao fruit tree – the two words may be used interchangeably to describe the same food. However, the term cacao is often used to describe the raw, unprocessed, pure cacao nib; it is richer in nutrients than processed cocoa. Cocoa typically refers to a roasted and alkali-processed powder. Cocoa is still a healthy choice but with diminished nutrient properties from the refining process. Always buy dark chocolate with the highest cacao content possible – 70% or higher is ideal. Check the ingredients label: choose chocolate that contains the fewest added ingredients. High quality chocolate typically contains 3-4 ingredients including cacao, cacao butter and sugar. Choose chocolate that lists cacao/cocoa (or cacao mass) as the first ingredient because the further down the line the ingredient is listed, the smaller percentage of that ingredient there is in the product. Avoid chocolate with artificial sweeteners added (stevia is fine but chocolate sweetened with it may taste bitter). Keep in mind that truly healthy chocolate comes from healthy trees and quality manufacturing processes, so you should expect to pay more for topnotch chocolate. Consider organic and fair trade options. Finally, be aware that most of the health benefits ascribed to cacao come from it’s high flavanol content and flavanols have a bitter and astringent flavour – very different from most mass produced chocolate bars. [xiii] This type of chocolate is extremely rich and just one or two squares will leave you completely happy and satisfied and once you get used to the new taste, you’ll never go back!